This whole quotation implies on civic x too. Moreover vezel is a crossover which are supposed to run on comparatively rough roads. If I summarize, I think Vezel got less votes and People are recommending Honda CIVIC over Vezel. Basically I had the new civic x and i kept for a year from 2017 to18 . my reviews about is that its a great car with modern shape and features but however the build quality is poor . A zero meter car made in 2017 had welding issues and the body quality was poor . its sound system and comfort was not good and if you open the trunk you will see the wires on the trunk and that area is not covered even inthe hood the there is no proper cover for the engine. for me with a family of 5 it was not a very comfortable car and the thing i hate about is that it had battery issues even though i had no extra lights in my car. 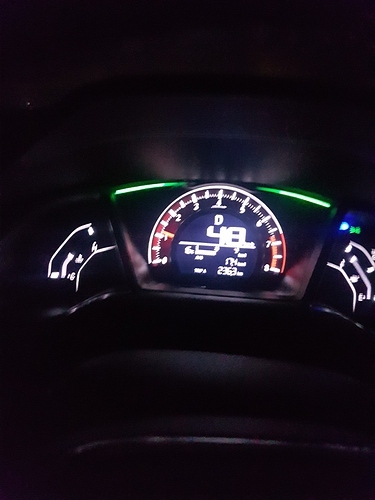 i sold the car in 2018 and its been 3 months since i have honda vezel and i love it. first of all it has a high ground clearance and its 0-100 is faster or somewhat same to the honda civic even though its a 1500cc car . vezel for me is more comfortable and more smooth.people complaining about its suspension is that it has a stiff suspension compared with corolla which has a soft suspension. most of the honda cars have stiff suspension for sporty drive and better grip. for me i prefer cars with better features which have new technology and i think it was the best choice for me to switch from civic to vezel. Yes it is. Vezel has far more features than civic like honda sensing which is extremely useful,awd which you can't get in civic and better infotainment and speaker system. It is has more ground clearance which is useful considering the conditions of Pakistan's roads. I am currently having Corolla Altis Grande 1.8 (2k17 Facelift Model 22,000km driven), and now i want to upgrade my Car, this time preferably a hybrid one (due to good mileage >15km/L and better Japanese build quality). I am having budget of 3.5 mil. I use to upgrade my car after every 2 years so i am quite confused mostly with the resale value and other technical and maintenance aspects of having a Hybrid car and for the same reason i was having another thought on upgrading to new Honda Civic 2018 (mainly due to the resale value, local manufacturing, availability of parts and services) I found out some negative/bad reviews about new Honda Civic like very low fuel mileage 6-7km/L (in Karachi), poor build quality and cheap material used in local manufacturing) I jus had an initial survey in the market where i have been told that in hybrid cars top 3 players in Karachi market are Toyota Aqua, Axio and Honda Vezel. I have researched and reviewed all available relevant topics on pakwheel forum but the information comments/feedbacks i found were quite old (between 2015-2016) and not up to the date. So, i need some serious help here from my Pakwheel community to help me out so that i can make a right decision and chose the best option between Hybrid car (preferably vezel 2015-17) or new Honda Civic 2018 in budget of 3.5 Mil. Please help. If you can mantain honda vezel than you should go for it; dct transmission and changing its oil is quite a difficult task. If I was at your place than I would have kept same corolla and change it in 2020 when new 12th generation corolla arrives. Dear Haseeb, Thanks for your valuable feedback. Can you please let me know further details about Vezel maintenance like you mentioned about dct transmission and its oil change? I use to maintain my Grande from Toyota after every 3 months (5000km service) which almost cost me around 12,000-14,000 PKR. Please give me an idea like what will be the approximate charges and frequency of these maintenance work? Service cost would be the same, toyota stealerships has a bad habit to charge tons of money. Mantainance work and cost would be equivalent as that of corolla getting serviced at stealerships, but spare parts and mantaining such hybrids in Pakistan is quite difficult. Honda sensing is not a useful feature in Pakistan. It is actually a pain in the "behind" to drive a car equipped with such systems on Pakistani roads. I don't understand why people keep talking about Honda sensing, CTBA and rest of the gimmicks. These features are a hindrance in our driving conditions. Bro you have to make your own decision based on your requirements and preferences but honestly going from FL Grande to Vezel is not an upgrade in my opinion. In the light of your concern (resale) no car in this category can beat the civic x even not Grande so I will suggest you to go for civic eye closed all other rumours about build quality etc have gone now because it was just about 1st or 2nd batch, I have civic 17-june delivered car and I didn't faced any issue to date for avg I am sharing the picture of my last visit to bwp from Rahim Yar Khan where road and traffic conditions are even worse than karachi. Yes it can't beat a hybrid but at the time of resale after one two year you will end up saving more in case of civic, few of my friends switched from Vezel to civic and they are quite happy due to comfort and driving experience as compared to Vezel's stiffer suspension. Parts and even minor accessories are a big headache in case of JDM, people argue that now a days it is esay but still you can't find accessories of most common JDM vitz as compared to any PKDM. At the end choice is yours and you won't regret in case of civic inn sha Allah. Hello Pakwheelers; hope you all are doing great. need your help again in deciding which car to buy next. BRV / Rush are no good either.